Blepharoplasty surgery is one of the most common cosmetic procedures performed in the country today. Blepharoplasty surgery can include upper lid blepharoplasty, lower lid blepharoplasty or both – what we call four lid blepharoplasty surgery. Why is this important? That is easy, because only an expert in blepahroplasty surgery should be trusted with your eyes. The eyes are the central feature of the face and if surgery is not done appropriately both appearance and vision can be affected. You want an eye (ophthalmology) trained cosmetic surgeon (oculoplastic surgeon) to perform blepharoplasty surgery on you. No one else has the same skills, experience or expertise with blepahroplasty surgery. Below are some examples of typical blepahroplasty surgery results. Blepharoplasty is upper or lower eyelid surgery to improve appearance and at times vision (upper lid blepharoplasty). Blepharoplasty surgery is performed by many specialists including general plastic surgeons, facial plastic surgeons and oculoplastics surgeons. As eyelid surgery is a very specialized form of cosmetic surgery it is important to make sure your surgeon has specific expertise in aesthetic eyelid surgery. When surgery does not turn out as planned, or complications occur, a re-operation is often needed. The re-operation is referred to as a revision procedure – or in this case revision blepharoplasty surgery. Few surgeons take on revision blepharoplasty surgery as it is significantly more complex than first time surgery. In revision blepharoplasty surgery, scarring, reduced blood supply and distorted anatomy make the procedure more difficult and unpredictable. What is important is to make sure that if you are in need of revision blepharoplasty surgery you only see an expert in the field. 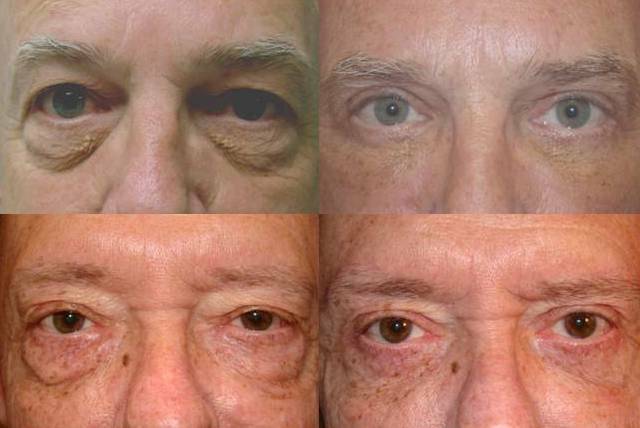 Only specialized eyelid surgeons should perform revision blepharoplasty surgery. Dr. Guy Massry (Beverly Hills Ophthalmic plastic Surgery) is one such expert who routinely performs revision blepharoplasty surgery. Please open this link to view results to revision eyelid surgery (including revision blepharoplasty surgery) http://drmassry.com/#/6-7. Beverly Hills is a city which is on the forefront of cosmetic surgery. One of the most common cosmetic procedures performed is blepharoplasty surgery http://www.drmassry.com/#/1-3. Put the city to the procedure and you get Beverly Hills blepharoplasty. I mention that because in Beverly Hills, blepharoplasty surgery is performed often and in high volume. Why is this? There is a high density of cosmetic surgeons in Beverly Hills and almost all perform blepharoplasty surgery. Beverly Hills is a city where many entertainers live. People who work in this industry tend to have cosmetic blepharoplasty performed more frequently than those who have other occupations. As there is a higher income per capita in cities like Beverly Hills, its residents can afford blepharoplasty surgery more than most. Because of the above reasons, Beverly Hills has developed a reputation as the place to go for cosmetic surgery such as blepharoplasty surgery. Now you should not base your decision on surgery on location, but rather on the surgeon. However, you may find that many of the best cosmetic surgeons in the country reside in affluent cities such as Beverly Hills. As such, Beverly Hills may be one of the best places to have your blepharoplasty surgery performed. I have recently written on revisional blepharoplasty surgery http://drmassry.com/blog/?p=262 and revisional canthoplasty surgery http://drmassry.com/blog/?p=286. I have received a great response from patients who have had complications from previous blepharoplasty and eyelid surgery and are interested on information on how to correct their problems. I believe before and after photographs of patients who have undergone revisional blepharoplasty surgery, revisional canthoplasty surgery or any revisional eyelid surgery are important. Before and after photographs are crucial to understanding what can be achieved from revisional surgery for these particular problems. In fact, they are the only real measure of outcome. I will continue to blog on revisional blepharoplasty surgery, revisional canthoplasty surgery and other revisonal eyelid surgeries. When I do I will put up new before and after photos if patients consent to this. In the meantime please refer to my web site for before and after photographs on revisional blepharoplasty, canthoplasty and eyelid surgery http://www.drmassry.com/#/1-6. I am Dr. Guy Massry (Beverly Hills Ophthalmic Plastic Surgery). I can be reached at (310) 453-8474 or at http://www.drmassry.com . I look forward to hearing from you soon. Canthoplasty surgery is an important part of lower eyelid blepharoplasty surgery. It functions to maintain the shape of and reinforce the lower eyelid, while preserving the angle formed where the upper and lower lids met laterally (the canthus or canthal angle). This is intricate surgery which requires specific expertise to get right. Ophthalmic Plastic surgeons perform canthoplasty surgery routinely and are the best surgeons to go to for canthoplasty surgery. Revisional canthoplasty surgery (redo surgery) is significantly more complicated than standard primary (first time) canthoplasty surgery. Each revisional canthoplasty is different and there is no surgical blueprint of what to do. I perform revisional canthoplasty commonly and believe that specific technique needs to be followed to prevent poor outcome. Even with excellent technique revisional canthoplasty can be unpredictable. This is because a canthus which has been previously disrupted from surgery has variable degrees of scarring present, reduced blood supply, and distorted anatomy. A successful outcome is dependent on surgical precision, anatomic knowledge and attention to detail. Eyelid fat grafting is a procedure in which fat from the body (abdomen, inner thigh) is harvested (collected) and then transferred (injected) into the hollows (depressions) around the eyelids. This is done to improve eyelid contour and appearance. Unfortunately, eyelid fat grafting can be associated with numerous complications which can be distressing to the patient and frustrating to the treating surgeon. What are these complications? Nodules: If the body considers the fat foreign to its new location an immunological reaction can occur leading to lumps/bumps (nodules) http://drmassry.com/blog/?p=277 . These are very hard to treat surgically as the nodules are scarred into place and do not obey anatomic tissue planes. As a result, their excision can lead to muscle damage and indentations. Also, eyelid fat grafting is a non-surgical procedure. Fixing this eyelid fat grafting complication requires surgery – NOT IDEAL. Prominences: A prominence, or what I call a bulge is different than a nodule in that it is not as hard and is more diffuse. A prominence is an eyelid fat grafting complication related to over-injecting fat or over-retention of fat. This eyelid fat grafting complication also requires surgery to remove. This procedure is much easier than removing nodules; however, can still lead to the same problems as excising nodules. Prolonged swelling: Some patients can swell for long period of time after eyelid fat grating. Treating this eyelid fat grafting complication typically involves oral and or injectable medications (ie. 5-fluoruracil). This fat grafting complication is usually easier to resolve than nodules and prominences. Scars/Darkening at harvesting and injecting sites: It is possible to develop a scar or darkened area at the entry site for harvesting the fat or injecting it. Obviously, the injection site is on the face and a bigger problem. Fortunately, these eyelid fat grafting complications are very rare. There are creams (lasers, etc) that can reduce the darkening. There are injected medications, creams, lasers and surgical revisions which can address the potential scars. Contour irregularities at the harvesting site. As the fat is harvested via liposuction techniques, it is possible to create an irregular contour to the area where the fat is taken. Again, this eyelid fat grafting complication is rare, and on occasion may require revision. These are the most common eyelid fat grafting complications I see. The best way to avoid them is to be informed of their potential prior to the procedure so that an informed decision can be made. Lower eyelid fat grafting (transfer) for filling depression (hollows) has become more common over the last 5 years (see link for patient examples http://drmassry.com/#/1-5.) Just because eyelid fat grafting has become more popular does not meant it is the right thing to do, or not associated with potential complications. Eyelid fat grafting involves taking frat from one area of the body and transferring it to the eyelids. Typically fat is harvested from the abdomen, inner thighs or other area and injected into the junction of the lower lid and cheek to fill the depression that exists there naturally, from aging or from previous surgery. This allows smoothing out the contour, potentially reducing dark circles, and improving appearance. Unfortunately, eyelid fat grafting can lead to irregularities (lumps/bumps) where it is injected which can be very bothersome and very difficult to remove. The best way to prevent this complication is to use sound technique, be well versed in eyelid surgery and anatomy, have experience with the procedure, and understand what NOT to do. Even with all precautions taken into account irregularities can occur. This is because the body recognizes the transferred fat as foreign to the area and sets up an immunological inflammatory reaction against the fat. The reaction presents clinically (what we see and feel) as hard nodules. The nodules can be treated with oral and injected (better) medications to smooth them out. Surgical removal can be complex and should be reserved as a last resort. Traditionally, surgeons have used steroid injections to the nodules. I have found these to potentially lead to tissue atrophy (more depressions) and thinning of already thin skin. 5 Fluorouracil is an anticancer drug which stops rapidly dividing cells. It has great utility in preventing and treating dermal scars (hypertrophic scars and keloids). 5 Fluorouracil admixed with a little steroid (for pain) can work very well (even better then steroids) for the nodules that can develop from eyelid fat grafting. 5-Fluorouracil is an anti-metabolite long used for treatment of cancer and more recently in an intralesional (into scar) fashion as an effective modality in the management of dermal scars, particularly hypertrophic scars and keloids. In ophthalmology, it is been used to prevent scarring after trabeculectomy (glaucoma) surgery. I use 5-Fluorouracil to manage cutaneous (skin) scars in patients after surgery, and have been very pleased with the results and negligible side effect profile. I still add some steroid in the injection (75% 5-FU 50 mg/ml/25% Kanalog 5mg/ml) to reduce pain and potential inflammation after injection. With this mixture I have not seen the tissue atrophy which can occur with steroid injections and feel 5-Fluorouracil is more efficacious in minimizing scar formation. Losing an eye is a very physically and emotionally traumatic event. This can occur because of trauma or a variety of diseases of the eye. When an eye is lost it is called anophthalmia. The surgery to correct this condition is a grab-bag term called anophthalmia surgery. Anophthalmia surgery can include blepharoplasty surgery (remove skin/fat/muscle from the lids), ptosis surgery (lift the upper lid), canthoplasty surgery (tighten/support the lower lid), socket surgery (surgery in the eye socket), orbital implant surgery (placing implants in the socket), and a variety of surgeries that use tissue grafts from the body transferred to the lids and socket. Traditionally anophthalmia surgery has been based on function (making sure things work right). In the more recent past I have concentrated on what I call aesthetic anopthalmia surgery. By this I don’t mean cosmetic surgery in the classical sense. I mean surgery with an aesthetic eye that not only improves function, but also restores appearance. This is an extremely important shift as how a false eye (prosthesis) looks is as important as how it works. In the near future I will write a series of posts on this subject to bring attention to what is available. Anyone who is anophthalmic and is unhappy with their prosthetic appearance is welcome to contact me to discuss this further. Blepharoplasty surgery should only be performed by an experienced and well-trained cosmetic surgeon. Ophthalmic plastic surgeons (oculoplastic surgeons) are expert blepharoplasty surgeons with cosmetic surgical training of the eyelids and surrounding areas (forehead/eyebrows/midface (cheeks). Oculoplastic surgeons are first trained in ophthalmology (eye diagnosis and treatment) before their cosmetic training in blepharoplasty surgery. Surgeons from numerous specialties such as otolaryngology (ENT), general plastic surgery and general surgery perform blepharoplasty. Clearly an eyelid expert (oculoplastic surgeon) is the best choice for blepharoplasty surgery. Oculoplastic surgeons performing blepharoplasty surgery will reduce the incidence of postoperative complications. Why? Because they are the best trained surgeons in eyelid (blepharoplasty) surgery. Oculoplastic surgeons are trained to diagnose and correct ptosis (weak eyelid muscle) which is often needed with blepharoplasty surgery. Oculoplastic surgeons are trained to deal with canthoplasty surgery which is often needed with lower lid blepharoplasty surgery .